Ascending Butterfly: $50 Novica.com Digital Gift Code Giveaway! This giveaway is now CLOSED. Thanks so much to our wonderful sponsor Novica! We look forward to working with you again! The winner is Beth E. Remember: There are great giveaways active on the upper right hand side of the page! It's officially Spring! And you know what that means! Yes that's right, my birthday is coming soon! As far as I'm concerned, having only one day to celebrate is no where near enough. I say celebrating this life will take at least a month! When I'm giving gifts I look for gifts that are unique and 'fit' the recipient, and I also love creative packaging. I love to add sweet embellishments (like butterflies!) that express my personality and that of the recipient! It's not always so easy to find Unique Gifts and creative packaging! Needless to say when I receive a gift that is creatively packaged it certainly adds to the excitement factor! Ascending Butterfly has made its mark by making sure we feature 'Corporations With a Conscience'. Brands that care enough to give back. As far as I'm concerned the best shopping, is 'Guilt Free' Shopping. Where your purchase actually makes a difference. Getting a discount is great, making a difference....like the famous commercial we all know says....PRICELESS! National Geographic in Association with Novica.com are helping to make art happen in the form of a Microcredit. 0 % Interest Free MicroFinancing for Artisans in developing nations. Now in addition to the fact that your order goes to helping the artisan that crafted your item, you can also get involved in the MicroFinancing and contribute to your favorite Artisan directly and help them meet their Financing Goals, which aids in expansion, adding items to inventory and more! Here is a list of Artisans currently seeking funding, you can also read a little more about each one and how they plan to use the funding. See the oh so cute little Llama embellishment on the raffia ribbon? This is just the kind of packaging I like, cute, creative and a sweet embellishment! I can't tell you how impressed I am with this sweater! It is mid-weight, keeps me warm on it's own without making me feel weighed down. It's soft, not itchy in any way, and I love the style, the cable detailing in the front is super stylish! I also greatly love the Vneck front, it doesn't plunge as much on me as on the model above, and the sleeves are not as long on me as on the model in the photo. Like little bear said it fit me 'just right'. ﻿I love sterling silver, and I also love the Celtic inspired Design on these earrings! Maybe it's because of the Gaelic origins of my first name! I've always been attracted to Celtic inspired jewelry, and what's a birthday without bling? By the way the Artisan is also an Aries like me! Coincidence I was attracted to her work? I'll let you decide! When I found out my order was coming from 2 different parts of the country, I had my reservations about fulfillment time. I thought the orders would take forever to arrive, but I was pleasantly surprised by just how fast my order arrived! I also loved how beautifully wrapped they both were! I would highly recommend Novica for all of your gift giving needs, it's definitely 'guilt free' shopping at its finest! You are not only giving back, you are empowering an artisan to help their small businesses not only thrive, but actually go global! How cool is that? Ƹ̵̡Ӝ̵̨̄Ʒ - WIN IT! - Ascending Butterfly and our friends at Novica have a very special surprise for 1 lucky winner! 1 winner will receive a $50 Novica.com digital gift code. Like I said, it's my birthday, but you get the gifts! Don't you just ♥ Novica? I know I do! Ƹ̵̡Ӝ̵̨̄Ʒ - How to Win: (1) You must be a PUBLIC follower of Ascending Butterfly to be eligible for this and all giveaways. Indicate in your entry that you follow (if your 'comment name/user id' differs from your profile id, please let me know what name you follow under) and (2)MANDATORY entry- Visit Novica.com and link us to what you will buy if you win! (3) You must also leave your email address somewhere in your comment. (You can format it this way for security, example: ascendingbutterfly AT mail host DOT com). (If your email is clearly visible in your profile, you can just say so, that's OK!) Please follow the easy 1, 2, 3 steps to winning (or in this case, the A,B,C’s of winning!) This giveaway is open to everyone 18 years of age or older. No PO Boxes. Ƹ̵̡Ӝ̵̨̄Ʒ - In the spirit of Spring Time Fun share with us your favorite sign of Spring! FTC Disclosure Info for this Giveaway: This is not a paid insertion. This is a non-compensated post and all opinions regarding the products and the sponsor are my own experiences. I was provided product to facilitate the review and giveaway. The sponsors are fulfilling directly to prize winner(s), this in no way influenced my opinion of the products. Once a winner is selected and their information has been forwarded to the sponsor, the responsibility of prize fulfillment rests with the sponsor. This is awesome... would love to have it. my fav sign of spring is when the bulbs and small plants start poking through the ground! and when the robins start coming back!! if I won. They are awesome!! my favorite sign of spring is admiring the first robin hopping around my back yard! I know that spring is coming soon! entered the handbag of the month giveaway! I voted today on your project chrysalis! I commented on the non-giveaway: Sunday Moment of Gratitude -Winning, Early Birthday Cake and More! I never have looked at the clothes on their site (always veer right to the jewelry!) but that sweater is really pretty, so now I will! My favorite sign of Spring is when the blossom peek out from the branches of our cherry tree. I voted on Project Chrysalis. My favorite sign of spring is the crocuses coming up. My favorite sign of spring is the grass needing to be cut! http://bit.ly/e1mwIw Thanks for another great giveaway! DAILY vote for you in Mom Central's Grow Your Personal Brand Grants Program. Thanks! My favorite sign of spring is the crocuses blooming, they are blooming now even though we're supposed to get snow tomorrow! Thanks! I entered your Spotlight Handbag of the Month Giveaway! Thanks! New favorite sign of Spring--we moved recently and, now that it is thawing, we have bunnies around! Yes, bunnies! How Spring is that! 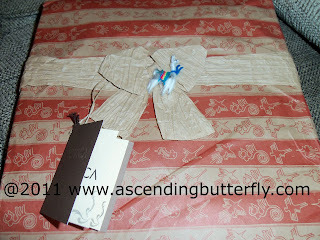 I already follow Novica on Facebook, so I wrote on their wall "I'm saying Hi from Ascending Butterfly." Does that count? I like the Pearl Wrap Bracelet Garland. My favorite sign of spring is watching our cats look at the birds outside our windows. I would definitely be getting this necklace. I have had my eye on it for some time now. My favorite sign of spring is blooming tulips. They're on their way! however, there are A LOT of things I'd love to get from there! Voted In Mom Central's Grant Program. goodluck! The Warming Sun...and the birds swooping around to build nests is my favorite sign of Spring! DAILY vote in the Mom Central's Grow Your Personal Brand Grants Program. Thanks! I voted for you on Mom Central's Grow Your Personal Brand Grants Program. Good Luck! I'm a GFC follower (email in profile). Their Wood hanger, 'Serpent Symmetry' caught my eye at NOVICA! http://www.novica.com/itemdetail/index.cfm?pid=173957 this is the link for the rose quartz bracelet. GFC follower. I would probably get the Blown glass water goblets, 'Imperial Aqua' (pair): http://www.novica.com/itemdetail/index.cfm?pid=151916 . I would get the Wool shawl, 'Ruby Ruffles' from Novica. I follow your blog publicly with GFC. (Theresa) I would love to get the Garnet anklet, Classic Red. My favorite sign of spring is seeing the daffodils bloom. I follow Novica on Facebook and told them you sent me. I follow Ascending Butterfly with Network Blogs. My favorite sign of Spring is the first spring birds singing. That's a for-sure giveaway that spring is around the corner! I follow Tracy on Twitter @Xocaisgood! I follow Novica on Twitter @Xocaisgood! I follow Ascending Butterfly on Networked Blogs! My favorite sign of spring: seeing birds and squirrels everywhere. I voted for Project Crysalis! Follow your blog publicly with GFC (Elena Shkinder-Gugel). I voted for your ‘Project Chrysalis’. Follow @Tracy_Iglesias on Twitter (@spelena). Follow @novica on Twitter (@spelena). I like Ascending Butterfly on Facebook (Elena Shkinder-Gugel). Follow Novica on Facebook and told them you sent me (Elena Shkinder-Gugel). Follow Ascending Butterfly on Networked Blogs (Elena Shkinder-Gugel).